All right, now THIS is more like it. MINOR SPOILERS for the episode, obviously. When writing about the premiere episode of the Michonne mini-series, titled “In Too Deep”, I said my major beef was that the story wasn’t particularly engaging given the fact both its main protagonists are already established to survive everything that will be thrown at them. 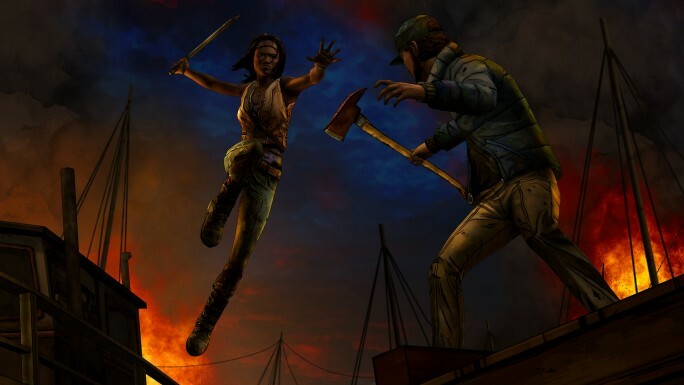 The only way Telltale was going to give Michonne any real stakes was to make the fates of the newly introduced characters matter to players, something they just didn’t achieve initially given how vaguely they were presented. Beginning precisely where the previous episode ended, “Give No Shelter” sees Michonne and Sam, who is grieving the loss of her brother Greg, enlisting the aid of two of Norma’s gang members to help them (along with Pete) escape the houseboat city. Upon reaching the shore, Sam leads them to her family home in the hopes they can lose Randal (Norma’s brother) and his crew before they hunt them down. Sam’s family are not prepared to face the horrors of the outside world, and Michonne must contend with whether they are truly safe staying where they are before it’s too late. First off, the pacing of “Give No Shelter” is a huge improvement over the last episode, despite its rather short, hour long runtime. It’s all systems go, right from the explosive escape from boat town up until about half way through when the group arrives at Sam’s house, where things settle down a little before amping up again for a conclusion that has certainly left me feeling uneasy about events to come in the finale. Where “In Too Deep” was slow and expository, “Give No Shelter” was a constant adrenaline pumper. This level of tension is achieved because Telltale did exactly what I said I hoped they’d do: they made me care about the supporting characters, particularly Sam and her family. Very early on we are exposed to Sam’s feelings regarding her brother’s death, and whether she is guilty for/thankful for not taking revenge on Zachary depending on your previous choices, which quickly establishes she’s not the brat she came off to be the first time around. As for her family, we learn of her father trying to keep himself together following the loss of his wife, her sister who is realising she has to stand up and be the strong one, and her sheltered younger brothers, unaware of the new cruel world. They aren’t fully fleshed out yet given the episode’s short runtime, but their strongly established characters were very effective at pulling on the heart strings. It also made one particular moment in the third act very shocking to witness. No spoilers, but I admit that I audibly gasped. Michonne herself remains just as powerful a character as she was in the premiere. She is still reeling from the memories of her past, haunted by the (still unknown to the player) fate of her two daughters, and her visions are starting to bleed into reality. I do find it a little little unbelievable that no one is calling her out for acting crazy given all the things they catch her doing when they snap her out of her hallucinations. But the flashback/hallucination scenes are starting to pique my interest since there’s now a mystery surrounding her children’s fate. I suspect there is something more sinister going on than simply finding them having turned into zombies, but I guess I’ll have to wait for the finale to find out. 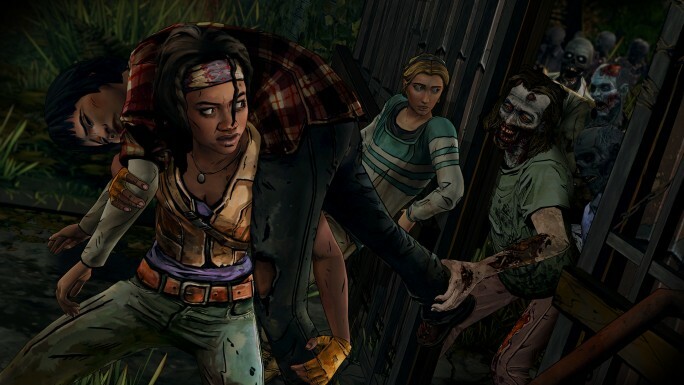 Here’s hoping it’s just as soul crushing as we’ve come to expect from Telltale. All in all, “Give No Shelter” was a very compelling episode, however it did seem like there were very few choices that had much bearing on the overall narrative, bar one right at the very end. But don’t worry, that choice was an agonising one to make and will hopefully have some huge ramifications on how the finale plays out. The game still has issues, like those annoying aspect ratio shifts for no discernible reason, but on the plus side the cinematic camera work continues to make the QTE combat sections look amazing. Pros: Adrenaline pumping pacing. Establishes characters we care about. Michonne’s mysterious back story. Some really brutal surprises. Cons: A little bit short. Really only one meaningful choice. THOSE GODDAMN ASPECT RATIO BARS. Follow Tom on Twitter to see all the rage he’ll express if AMC change the Walking Dead finale on Monday from what happens in the comics: @tomdheath. For more gaming news, follow LoadScreen on Twitter,@load_screen, and like on Facebook.